Printed circuit broker, Elmatica, recently released a new film about product development, explaining why cooperating with an experienced partner could be a smart move. The animated movie (accessible at www.youtube.com/watch?v=kGFJvLBqmCE) follows a product, this time a robot, from when the idea is hatched in the designer’s head until the finished product is loaded safe and sound on an aeroplane towards the end customer. The whole process is supported by the printed circuit broker. “The product development process is broken down as a six-step process from idea generation to launch. 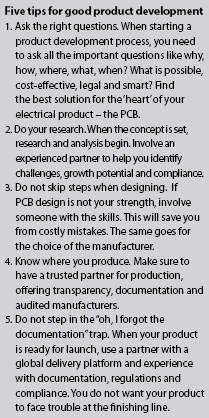 We want to focus on how close cooperation with an experienced partner, which knows PCBs by heart, can improve the process and ensure that cost and time saving elements are considered in all phases,” says Bech. Elmatica has supported the development of thousands of products since its establishment in 1971. Even if the process is more or less the same in 2019 compared to 1971, some things have changed as several companies have outsourced parts of their supply chain and products have increased in complexity, with the result that many are often more reliant on external knowledge and specialists. “We have organised our products to match different parts of your development process. This makes it easier for you to understand what we do, and for you to decide when and how you would like to include us. In this movie, we show how each of our products can fit with your product development process, supporting it from the beginning until the end, delivering technical assistance, auditing, experience, seminars and contacts,” says Bech.